So what about the beachfront? 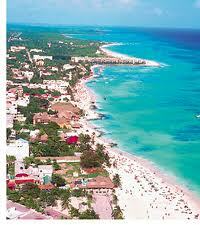 Playa del Carmen oceanfront properties are the dreams of many people throughout the world. It is a combination of various factors that make them so high in demand. First, the beachfront here in Playa del Carmen is accessible from basically any point or any street of the downtown living area. You can be living on 5th avenue or further back onto 20th avenue and still have walking access to beautiful beaches. The Playa del Carmen beachfront real estate market is distinguished from all other areas by it's turquoise blue Caribbean waters. People travel thousands of miles to have the opportunity to sit in front of these waters for a simple afternoon and be mesmerized with it glowing, intense blue lures. Imagine waking up each morning to see an oceanfront view outside of their property that many people have as screen savers or posters on their walls. The soft white beaches in the Riviera Maya create a beautiful contrast to the vibrant turquoise blue waters. And in many parts along the state, a few meters off of the oceanfront, you will see the water crashing along a reef. This reef is known as the Mesoamerican Barrier Reef and is the second largest in the world. This incredibly beautiful occurrence is host to thousands of underwater sea creatures that can be seen from snorkel gear or scuba diving equipment. If you want to learn more on Playa del Carmen beachfront real estate options including beach house for sale, or oceanfront condos please send us an email or contact us by phone.